This year marks the 25th anniversary of DC Comics’ legendary Vertigo mature-readers imprint—although you’d be forgiven for not knowing that. Aside from the welcome announcement of the Neil Gaiman-curated Sandman Universe imprint, Vertigo has had a quiet 2018, with a handful of new mini-series but no particular fanfare amidst the exciting announcements of new DC Comics initiatives like the DC Ink Young Adult line, the DC Zoom middle-grade collection and DC Black Label, a new set of “edgy,” standalone takes on DC’s most iconic heroes. All of that changes this fall, when Executive Editor Mark Doyle oversees a line-wide Vertigo relaunch and rebranding aimed at injecting new life into the once-revolutionary imprint. Doyle began his comics editorial career at Vertigo in 2006, and returned to the imprint last year after a stint overseeing the Batman group of titles for DC proper. Under his leadership, Vertigo editorial is “rededicating its focus to creating modern, socially relevant, high-concept, inventive stories appealing to readers of all genres.” The first new slate of titles celebrating Vertigo’s 25th year includes seven new series from creators with various entertainment backgrounds, including gaming, television, podcasts, art direction and, yes, comic books. Four monthly series will launch this fall and winter, with the remaining titles following in early 2019. 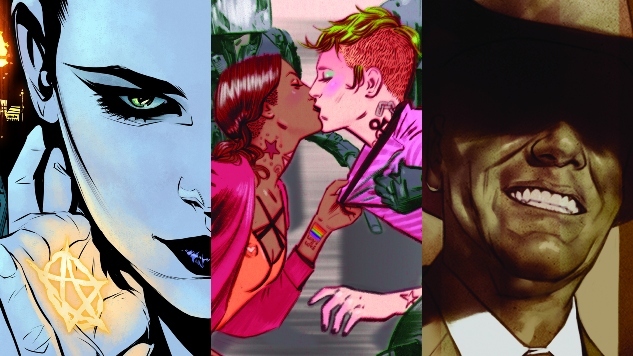 For a full breakdown of the seven new titles, including creative teams and covers, keep reading below—and be sure to check back later this year for Paste’s thoughts on Vertigo’s latest revival. When a crack in the border between worlds releases an army of monsters from Mexican folklore into the small town of Devil’s Fork, Arizona, the residents blame the ensuing weirdness—the shared nightmares, the otherworldly radio transmissions, the mysterious goat mutilations—on “God-dang illegals.” With racial tensions supernaturally charged, it’s up to new kid in town Frank Dominguez and a motley crew of high school misfits to discover what’s REALLY going on.